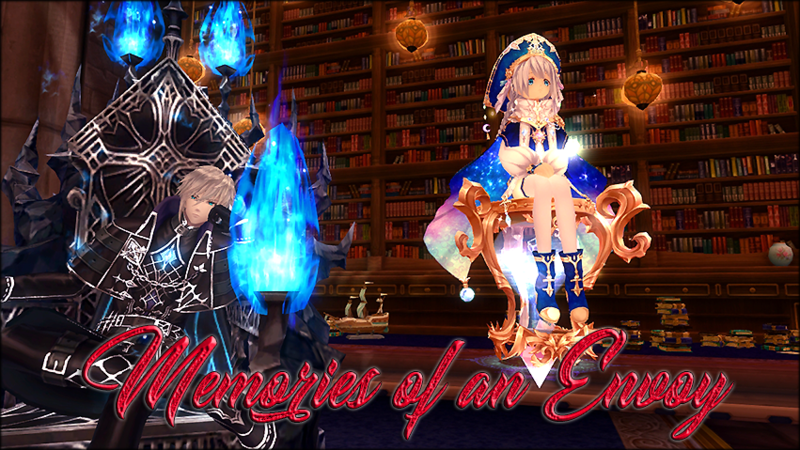 Thread: [Anniversary Event] Memories of An Envoy! One day, wandering through Navea, you found something truly unusual -I'm not talking about everyone's suddenly liking Beebis level of unusual or the fact that the latest revealed Eidolon is not a loli-. The thing that caught your attention was a huge, strange, and deep hole on a Tree. What could this mean? So you did exactly what any wise person would: you stuck your head on the hole without giving it too much thought. Much to your surprise, this wasn't an actual hole: it was a portal to a Secret Hidden Library. And of course, the biggest library rat of Azuria was there. Chronos, the famous God of Time, was just as surprise as you to find your presence there. But she didn't had any time to react since Chronos was quite busy herself looking for something. Everyone would think Chronos stood up by her power of organization, but in fact, she misplaced four pages of the Book of Time. Now, it doesn’t take you to be an Ancient and Immortal God to understand what this means: if something is missing from the Book of Time, it’s like it never happened. And which four pages were? You guess it: the four last years of Azuria’s History, basically, the time when you was awaken as an Envoy for the first time. It took you to travel to the land where everything started to find the help of an unlikely Hero in this story. Gigas was building up his steel body and training up his legendary muscles when you interrupted. As unhappy as he was by the distraction, he gave you a valuable piece of advice: Who would benefit the most by your sudden disappearance from this world? By your surprise it wasn’t Victoria, who you would think totally hates your guts by the hateful looks she gives you in every mission. The Forces of Evil might be the ones behind this catastrophic adventure, so you would need to get into the depths of Dungeons to find the first missing page of the Book of Time. Gigas also mentioned that the beautiful Goddess of Fate, Verdandi, might be of help to find the second page of the book. Believe or not, even a Goddess needs to work for a living, and if there’s something Verdandi enjoys is to mess up with the head of those “little humans”. She got a gig as a Fortune Teller in the most magic place of all: Enchanted Valley –but far enough as possible from the Ministery of Magic, because no God truly enjoys the company of a magic human-. One can never trust completely the word of Verdandi, since she might be always playing with the facts just to force you to make a terrible decision. But in this case, her advice seemed quite reasonable: Afraid by your latest discover of the First Page, the Evil Forces hidden the Second Page quite deeper. They are in power of the terrible bosses of level 85+ dungeons. Nothing screams problems like asking for the help of a moody God that could curse your soul for eternity while he drinks a glass of wine. But was indeed Hades the one suitable in this occasion to put you on the lead of the Third Page. You would have to look even deeper, since the Third Page was now in power of bosses of level 90+ dungeons and –rumor has it- was pretty rare and hard to find. Now and then. Your journey took you back where you started: in the Hidden Library of Chronos. Apparently, in order to secure your future you need to make amends with your past. And this is exactly why Chronos asked you merge Page 1, 2 and 3 from the Book of Time to find the Fourth Page. To celebrate the four years we have been together we have prepare you a special event. There are a total of five quests that you will find from your exclamation mark and that will take you through different maps and different conversations. Each of the Gods will ask you to recover different Pages that are missing from the Book of Time. These pages will be dropping, at a different rate, by Bosses inside Dungeons. The First Page will be dropping in almost every dungeon of the game, with the exception of abusable dungeons that we have took from the list. The Second Page will be dropping in level 85+ dungeons. The Third Page will be dropping in level 90+ dungeons. The quests are level 90, account bounded and can only be done once. They will give you quite a generous exp reward. In addition, once you finish all the quests, you will receive as prize a Level 85 Insta Level Card, that will allow you to create a new character 85 with all previous quests done! The event will start after tomorrow's maintenance (On February 15th) and will last for exactly one week. It's nice people need to have a Lv90 character to do that quest first. Thank you for the event! Aura this may sounds stupid, but what is abusable dungeons means?